Tablets, as we’ve written about before, are ideal shopping devices, generating outsized sales despite their smaller reach. But now, it appears that tablets have outpaced smartphones in the sheer amount of traffic they deliver to commerce sites, according to online marketing technology company Monetate. Monetate, which analyzes more than 100 million online shopping experiences, said that in the first quarter of 2012, tablet traffic to commerce sites hit 6.52 percent, overtaking smartphones (5.35 percent) for the first time. In the last year, tablets’ traffic increased 348 percent while smartphones visits grew by 117 percent over the same period. Almost all of the traffic (95 percent) was from the iPad (s aapl), said Monetate. The rise of tablets is chipping away at the PC, which saw its share of traffic to commerce sites drop to 88 percent, a steep four percent drop in just one quarter. At this pace, PC traffic should fall below 75 percent within the next year. Monetate’s numbers are more aggressive than previous figures from Adobe (s adbe), which reported last month that tablet traffic worldwide will exceed smartphones by early 2013 and represent 10 percent of website traffic in early 2014. The difference may be Monetate’s focus on commerce web sites, which may get more tablet traffic than other sites. Kurt Heinemann, the CMO of Monetate, said tablet traffic should hit double digits by this year’s holiday season. He said tablets offer the best of both worlds, offering more of the portability of a smartphone but with a bigger UI that encourages shopping and browsing. Monetate, which serves more than 100 top commerce sites, said smartphone traffic peaked at 7.1 percent during Black Friday and Cyber Monday last year. Heinemann said the smartphone will continue to drive traffic but it will be more as a reference device, letting people do research in stores or see products that they click through from emails. Tablets are in many ways performing like PCs when it comes to commerce. Monetate found that tablets converted visits into purchases at a rate of 3.23 percent, not far behind the PC at 3.51 percent and well ahead of smartphones at 1.39 percent. Tablet users view an average of 11.07 pages per session, compared to 12.05 page views for PC users and 7.18 pages for smartphone users. And tablet owners add items to their cart at a rate of 9.66 percent, compared to 10.2 percent for PC users and 4.25 perent for smartphone users. Heinemann thinks that tablets can do even better than PCs if websites start tailoring their experiences for them. Right now, most are still oriented toward a desktop experience. But there is still more optimization that can be done for tablets, including better touch navigation and bigger links. We’re still early in the tablet boom and the couch commerce era is just getting underway. There’s still more than retailers can do to optimize for tablet visitors. That might be just better touch and swipe navigation or it may mean some consider tablet-specific sites. But the tide is clearly turning toward tablets and that’s only going to continue. So, are you pretending that anything other than the iPad is succeeding to prove that we’re not biased, or because you are? As an Android user, I set my browser user agent to display me as iPhone just because most websites are designed for mobile on iPhone. At what point should you replace the word tablet with iPad? When the traffic share reaches 96 percent? Going all Gartner-ish on us, Ryan? This is why they said tablet and not iPad you fanboys. If you use the term “fanboy” you have already lost the argument. Using 2009 data for a 2012 argument? That’s the same mentality that is getting RIM and Nokia killed. Even the Mac has higher market share than ever and is killing the PC on the important $1000 and up sales metric. Also note Apple has more profit from the iPhone than Microsoft has PERIOD. That might explain why Microsoft is rushing to market with their own Windows 8 tablet, the Surface. 2009? You’re kidding right. Maybe you AND Steve Ballmer need to realize that it’s 2012. I guess I wasn’t clear on the point that I was trying to drive, but to say that Android at %5 of marketshare is irrelevant in the tablet space is as shortsighted as Microsoft saying that Mac is a non starter in 2009 with their 5% marketshare, for all the reasons that you have all listed. Furthermore, for anyone that actually read the EQ1 eBook, which most likely you have not, they do not disclose the sources/sites that are part of their statistical analysis so this article essentially means nothing. if 95% of the “tablet” market was the iPad, there is no tablet market. It is the iPad. Sure, “tablets” are driving more ecommerce like the earth is made up of 70% “liquids.” Where tablets are to iPads as liquids are to water. Apple iPad accounts for more ecommerce traffic than all SmartPhones. Gotta pander to the Android folks. Android has so many activations, yet, it’s fails to generate the majority of web traffic from either smartphones or tablets. Most Android phones are really being used as feature or dumb phones and Android tablets are mostly non-exisitant. Once you subtract e-readers (Kindle), Android tablets like the Fire, Nook and Galaxy Tab make up only around 10%. leaving Apple with the other 90%. The tablet numbers should exclude non-color e-readers, then it’s easy to see the “Tablet” market, is really just the iPad market. Ryan obviously meant iPads, not tablets. Why not just come out and say it? Even the iPad in photo illustrating the story has had the Apple logo removed. This is a good example of commentators in their strive to be balanced, actually giving a distorted and inaccurate picture. By overstating the relevance of the 5% non Apple Tablets, the article misleads us. i noticed that too. why scrub out the truth? Regarding the photo, most stock photography comes with logos removed so I’d guess they are likely blameless on that part. 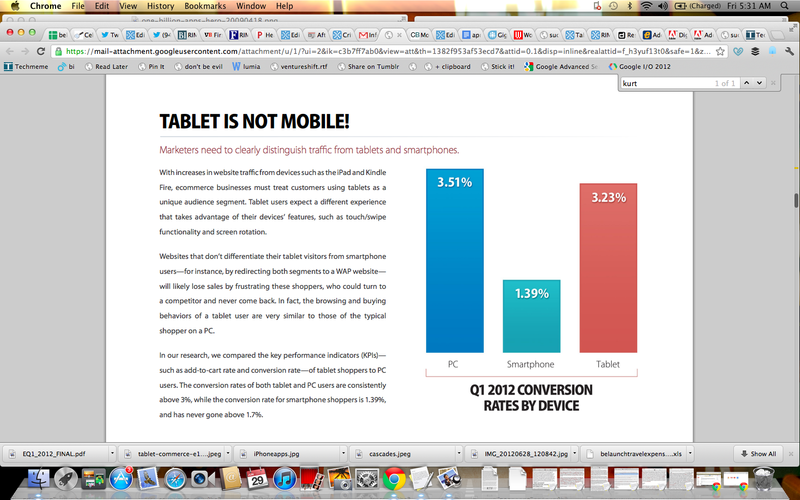 shouldn’t the headline read iPad now drive more ecommerce traffic than smartphones ? This is definitely an iPad dominated market at the moment. There is no ‘tablet’ market. Why does the article just say 6.19 % of traffic is from iPads? At 95%, aren’t the other ones irrelevant? I’d really like an answer from GigaOm to EB’s question. The continuing articles pretending that there is tablet market market, when really there is only an iPad market are getting really, really tiresome. Please enlighten us. You guys are supposed to be journalists, time to defend yourself, or change the article to reflect reality. Cmon guys, there ARE other tablets. To change title to iPad is like changing all articles about PCs to “Windows-based PCs” just b/c Macs represent only ~5% worldwide. Yet we don’t say there’s no “Mac” market, do we? @alextheukranian, Macs may own less than 5% sales worldwide, but they own a lot more than that of retail sales in the US. Many if not most Windows PC sales are in bulk by big businesses. A large percentage of these do not purchase software beyond Microsoft Office, and what comes with the computer. Meaning if you are considering Windows a software platform, you cannot target the large number of office cubicle computers which will never purchase your software, neither can you target cash registers and ATM machines. You can only target computers which have a chance to load your software. From the point of developers, the Mac market makes up a lot more than 5% of “addressable computers”, computers where there is a chance your software will be used and purchased. So it comes down to what you are calling a “market”, are you simply interested in hardware sales? Then the sheer volume of PC shipments does indeed dwarf Apple, and unless you are looking at profit share, you could just call it the PC market. In fact that is very often what it is called anyway. So why is your headline wrong, GigaOm? I suppose the prospect (or reality) is too overwhelming at present. Though I find it hard to doubt that were Windows or Android tablets to assume such a preponderant proportion of the market, there would be less hesitation to “call it like it really is”. This is the true “Reality Distortion Field” as it operates in the tech reporting world in this day and age. Guys, thanks for reading. Look, this is a category comparison. Monetate set this up as PC vs smartphone vs tablet. They didn’t get into specific breakdowns by manufacturers of other categories but they did for tablets. I clearly noted that and that’s how you know that 95 percent of the traffic comes from tablets. Yes, that’s pretty dominant. Will it always be that way? Who knows. But for now, I’m fine with comparing categories and letting you the reader know what that means. If I omitted that information, that would have been wrong but I didn’t do that. If you remove the iPad from the tablet category there is no story. If you just count the iPad, the story remains the same. So yes you are attempting to mislead. But hay if your happy with that, fine. Just don’t expect anyone to be fooled by your excuse. So why does the title and the article talk about “tablets”. Shouldn’t it talk about iPads. There is no tablet market – it is a iPad market. I’d like to know the answer to this too. Why are news organizations tripping over themselves to dance around the fact that Apple owns the so-called “tablet” market. It reminds me of when we talked about “mp3” players when it was the iPod. If Ford motor company sold 95% of the cars on the road, would we be talking about the “car market”? Google doesn’t own 95% of search and we call internet searching “googling”. What gives with this artificial creation of a nonexistent tablet market? It really is a type of lie.